"Bountiful Blessings" is a great little devotional book that is a nice little escape each day. This is a great way to focus on God and get your mindset in a good place for the day or if you need a few minutes to relax and refocus. There is a short reading, a short devotional on one page and then on the opposite page is a picture to color that corresponds with the reading. This book is a great little gift to give to others, to tuck in as a gift for everyday or a book to keep for yourself as a little treat. I loved this book and I love how the readings and pictures are nice, but not too detailed or too depth, so that my kids enjoy coloring in this with me as well and also going through the readings. "Spread too Thin: opting out of frantic living - opting in to lasting peace" is a book that everyone should read based upon what life is like in today's society. We all have endless to-do lists and once we get out of bed in the morning to the time our heads hit the pillow at night it is go, go, go all day, balancing work, family members' individual activities, housework, cooking, appointments here and there. This book is designed to be read and used over the course of 90 days. I read through the readings, but did not complete the interaction sections for each day as I am going to go back and work through this day by day to get the full benefit out of the book. However, already I find myself thinking and personally assessing my daily schedule to see changes I can make. I love the layout of this book as it is a quick reading for each day, followed by questions to think about and answer as to how this area applies and what can be identified as a hindrance and leading to the frantic living instead of a slower pace, more intentional way of living and being in the moment. Each day ends with a prayer as well. I highly recommend this devotional book and cannot wait to see how my life really changes over the course of 90 days. Tyndale has shared a link for a sneak peak! To read chapter 1, the first 7 days, click here! "Beneath the Surface" is book #1 in a brand-new series, Dive Team Investigations, from Lynn H. Blackburn. Leigh needs a change in her life following an incident that placed her in danger and she has decided to return home. Home is safe, or so she believes. However, she soon discovers it is not and she seeks the help from her old friend from high school, Ryan, who is an investigator. Ryan enjoys his career, especially the time he volunteers with the dive team for the local Sheriff's department. As Ryan spends time with Leigh and investigating her situation, he finds a connection with her during one of his dives that leaves him unsettled and fearing for the worst for Leigh. This is such a good book! Lynn has done a great job with setting the scene and introducing the characters, that I hope to read more about them in the upcoming books in this series! I could not read this book fast enough, as there are so many twists and turns and questions! The characters' interactions were great to read as well and I felt like I was a part of the story as it was all so lifelike! I am looking forward to book #2! What will an undercover English DEA agent do to protect the Amish girl he loves? Alice shouldn't like-or want-Calvin. He's English, has a questionable past, and an even more questionable job. Still, she can't help being intrigued. Though Calvin assures Alice that he's worthy of her, she's torn between surrendering to her growing feelings and steering clear of him. Shelley Shepard Gray is a "New York Times" and "USA Today" bestselling author, a finalist for the American Christian Fiction Writers prestigious Carol Award, and a two-time HOLT Medallion winner. She lives in southern Ohio, where she writes full-time, bakes too much, and can often be found walking her dachshunds on her town's bike trail. "His Risk" is the next addition to Shelley Shepard Gray's The Amish of Hart County series and it is a great read from start to finish. Calvin has not been home in years, once he left the Amish community as a teenager. However, now that his brother is sick, he has returned home, but he encounters more than he anticipated as he falls for an Amish woman. However, Alice does not know Calvin's secrets, one main one that is unintentionally placing her and others at risk. This book is very well-written and is a nice mix of suspense and romance. The characters are all ones that the reader can relate to and ones that are easy to empathize with. I have enjoyed every book in this series and this one is so good as well! I am looking forward to what Shelley writes next! To read more reviews included on this blog tour go, here! "A Refuge Assured" is such a beautiful and well-written book! Jocelyn Green is an amazing author of historical fiction as she deftly weaves historical details into the story and brings the characters to life as their emotions jump off the pages and the reader is so easily immersed in the story. Vivienne is a creator of lace, this is a job and role that she has loved and enjoyed; however now it is causing her life to be threatened and she is forced to flee Paris. Vivienne arrives in America looking for a safe place and finds that in Philadelphia; however there are political tensions which she finds herself in the midst of once again, but at least her life will be spared. Liam just wants to live in peace and work the land that has been hard fought for; however he is quickly drawn into the tension and disagreements as well. Vivienne and Liam are both longing for peace and being able to live their lives and are drawn into the struggles and yet their hearts begin to become involved as well. This book is filled with amazing characters! Vivienne and Liam are both well-developed and strong main characters and I love how they came so alive and real throughout the pages. The historical detail is wonderful in this book, I feel like I have learned so much more about this time period and the struggles of this time and the political unrest in France and America both and what daily living would have been like. I am looking forward to reading Jocelyn's next book! Sam Kass was the chef for the Obamas during their time in the White House and he has played an important role in promoting healthier eating in this nation. "Eat a Little Better: great flavor, good health, better world" is a brand-new book by Sam and this is a great book to have! Not only does it have so many good recipes that sound amazing and good for you, but it also has so many tips and ideas for making better choices in regards to our health and environment as far as growing food, what to look for in produce and making choices with shopping, cooking and eating. Here's one recipe that is included, easy to make, healthy to eat and delicious! You may not have an election or debate coming up, but we all need a lucky charm, or at least a meal that comes together in minutes. Feel free to cook the chicken, boil the pasta, and even make the pesto the night before. If you do, under-cook the pasta slightly or reheat it in just a little water in a saute pan. Store the pesto in the fridge with plastic wrap pressed against the surface to keep natural discoloration at a minimum. 1. Cook the pasta in boiling salty water until al dente. Drain, reserving 1 cup of the water. 2. While the pasta cooks, drop the garlic into a food processor with the motor running and process until the garlic is finely chopped. Add the basil, nuts, cheese, half the oil, and ½ teaspoon of salt and pulse to a coarse puree. With the motor running, add the remaining oil in a slow stream and keep processing until pretty smooth. 3. 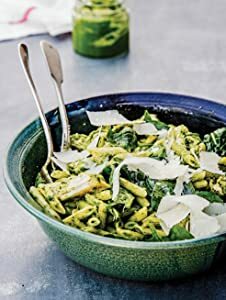 Toss the hot pasta with the pesto, chicken, spinach, and ⅓ cup of the reserved pasta water. Gradually add more of the pasta water if the dish seems dry. Season with salt to taste and top with more grated or shaved parmesan. - 2 skin-on chicken breasts, about 6 ounces each. - 1 tablespoon extra-virgin olive oil. Preheat the oven to 450°F. Put the chicken breasts on a parchment-lined baking sheet and coat with the oil. Season generously all over with salt, about 1 teaspoon total. Roast them skin-side up until lightly browned and fully cooked bustill juicy, about 20 minutes. Let them rest on a cutting board for a few minutes, then cut into bite-sized pieces. I highly recommend this book to read through for ideas for making healthier choices and the recipes all sound great and look great in the pictures! To learn more about Sam, go here! 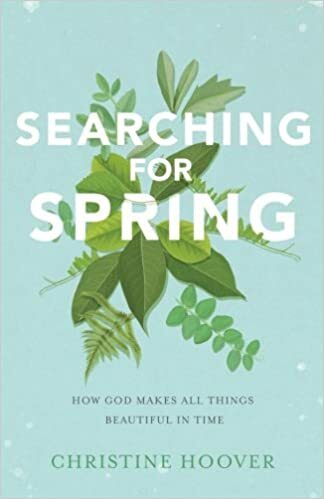 "Searching for Spring: how God makes all things beautiful in time" is really a beautiful, eye-opening book to read and become lost in. Christine does an incredible job with really capturing the beauty in the world, all around us, in the unexpected areas and the expected ones both. There is a season for everything and as the seasons change, our eyes are open to the beauty in our physical environments. However, it can be difficult to see the beauty in the midst of hard times and times that we feel beaten and defeated and overwhelmed by daily life. This book is a nice mixture of personal stories, scripture and imagery to portray these thoughts and really help awaken a person to seeing the beauty and remembering that God has a plan and purpose in His time. I think that this is a book that anyone, no matter where they are on their walk with Jesus, a new believer, one struggling to place faith and trust in God, or one whom has been a part of God's family for years, would appreciate this and find some peace and beauty within the pages. God is present in our time of need. He delivers His unmerited gift of grace in His perfect timing. "Grace Revealed" is a collection of stories of people whom have experienced God's grace in the midst of hard times and struggles. Divided into chapters based on the type of struggle, each story is shared individually and reflected upon by the author and then a reflection area for the reader. This book is such an inspiring read and one that will give the reader hope of making it through a hard time. This is a great reminder that God is always with us and will help in our time of need. The personal reflection sections and the insights are what really stood out to me the most, really resonating that truths that were shared and driving home that point that God is always there, taking care and revealing His grace in His time. "Why I Hate Green Beans"
Oh my goodness, this is such a great read and when you finish reading you will feel like you have a new best friend (well you will be longing for Lincee to be your new best friend!). "Why I Hate Green Beans" is Lincee sharing her heart, her insecurities, her journey throughout life and honestly it will be as if you are reading entries from your own old diaries (if you kept one!) and a look into your own heart and mind. It is so easy to feel down on ourselves and struggle with how we look, how clothes fit and look on us and how we compare to others around us with mothering, being a friend, how we look, everything. Lincee shares all that and more in this book. I found myself laughing out loud at various parts and thinking that she totally gets me at some parts and feeling as if she could have been reading my thoughts at other times. This is a quick read that is so good, a great break to take and escape away to that will leave you feeling refreshed and ready to face the day! Naomi Schaefer Riley is the author of Be the Parent, Please: Stop Banning Seesaws and Start Banning Snapchat (Templeton Press, 2018). She is a visiting fellow at the American Enterprise Institute and a former Wall Street Journal editor and writer whose work focuses on higher education, religion, philanthropy and culture. Her book, ’Til Faith Do Us Part: How Interfaith Marriage is Transforming America (Oxford, 2013), was named an editor’s pick by the New York Times Book Review. For more information, please visit http://www.naomiriley.com/ and follow the author on Facebook and Twitter. Wow, this is a book that is so relevant to today! Technology is everywhere and children start utilizing it and being consumers of it starting out so young. The purpose of this book is not to say that technology is a bad thing, but it needs to be used wisely and the impact on children needs to be thought about and considered. The author has done extensive research on this topic which is evident throughout this book and it is presented in an easy to read, easy to understand, non-threatening style. Personally, my favorite thing about the book is the "tips for cutting back" which are interspersed throughout the book. These little boxes are filled with doable tips and great thoughts and ideas. One of my favorites is to indulge the children a bit to help ease the feelings of missing out on screen time by taking them to a bookstore to pick out a book or a board game or to the park to spend time playing together and creating. This book is an excellent read that is thought-provoking and filled with information to help with lessening the use of technology and its' pull not only on children but on the entire family. "Eating From the Ground Up"